Start by opening a DS9 window before running this task and by editing the parameters for the task "sne". be identical to that in the file specified in the "coordinates" parameter. the supernova name is "SN03T". the next two columns have precise equatorial coordinates (2000.0) for each star. computed only for the stars in this file. BVRIU; in the SDSS system the order is ugriBV; in the Persson system the order is YJHK. file must be entered in the "imsets" parameter. Note that this is not exactly identical to the file used with the task "standards". parameter is a photometric zero-point for each filter. objects in the standard system (eval.25apr03a, in this example). 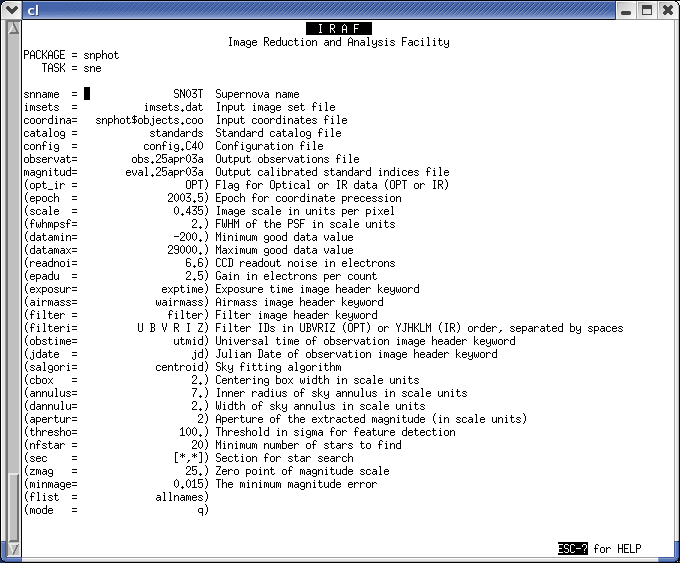 The "opt_ir" parameter specifies whether you are working with CCD or infrared images. in the snphot$objects.coo file to the epoch of observation. The filter order must be either "UBVRIZ", "ugriBV", or "YJHKLM". is the "minimum magnitude error" for the psf magnitudes. be used to identify the brightest stars. If the task doesn't find "nfstar"
circles. Hopefully enough of these stars will be present in the "coordinates"
geometric transformation from pixel coordinates to equatorial coordinates. (xrotation and yrotation) and the rms of the fit (xrms and yrms). previously determined geometric solution to find the remaining local standards. marked with purple circles and identified with their ID numbers. to write the PSF to a file. PSF fits will be attempted for the supernova and all of the sequence stars. The PSF fits will be performed with the fitting radius specified with the "aperture"
frame 2. You can use the blink option in DS9 to check the residuals. You will have two new text files at the end. In this example "obs.25apr03a"
contains the instrumental magnitudes and uncertainties. The file "eval.25apr03a"
is a text file with the magnitudes of the supernova and local standards in the standard system.